Printable worksheets, reading comprehension passages, and coloring pages to use during Black History Month. Figures highlighted include Dr. Martin Luther King, Rosa Parks, Harriet Tubman, Guy Bluford, and others. This is a biographical article on the life of Dr. Martin Luther King, Jr. Following the article is a page of reading comprehension questions. Guy Bluford is an aerospace engineer, astronaut, and Air Force Pilot. In 1983, he became the first African American to fly in sspace. Dr. King was a minister and spokesperson for the American Civil Rights Movement. Harriet Tubman was the conductor of the Underground Railroad. In the mid-1800s, she personally led countless slaves to freedom. 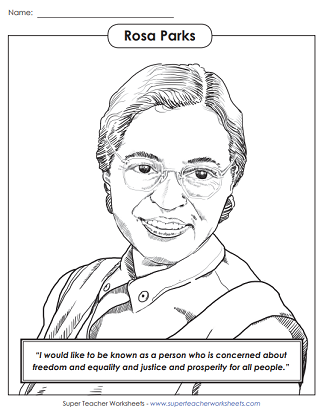 Rosa Parks was an activist during the American Civil Rights Movement. 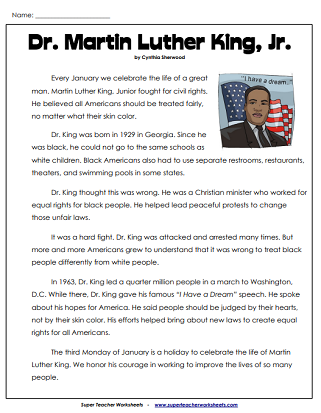 This page contains a series of worksheets to celebrate the life of Dr. Martin Luther King Jr. Here you'll find resources to help your students learn about famous women throughout history.